← Previous PostWho is that Man in the Picture? Hi Jacob. I’m glad you found us. And note that this is a “real” picture for a real town in northern Michigan. No photoshop here. First of all, let me begin by saying how much I love reading this website. It has become one of the few things I do before I brush my teeth each morning. Second, I’m glad to see that you guys encourage people to comment. Even though you guys are really smart academics, it’s heartening to see that you guys actually read an average Joe’s comments. I really hope more and more people will participate in this on-going dialogue about rhetoric and public culture because of its growing importance in the world dictated by more and more media coverage. Finally, as for the photo, it reminds me of the old adage about how every empire will eventually fall. First, this is because the sign, which has big-capitalized letters of “EMPIRE” on the top, seems to scream the innate desire of all empires to remain in power forever. 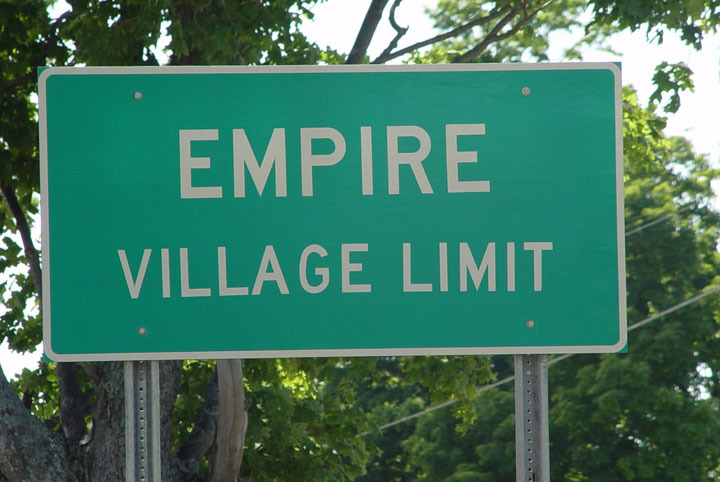 Yet, the words “VILLAGE LIMIT” (albeit, shortsightedly in smaller font), demonstrates that no empire could truly stay forever in power, and there will always be an extent as to how much an empire could grow. It achieves this by demarcating the space of how much this “EMPIRE” could actually expand in the future. So even though the trees still seem lush and green, you can see wires on background perhaps trying to intrude its way through the physical barrier. The wires represent again, the desire of the EMPIRE to expand beyond their limit, and whether they will succeed or not seems to be determined by the words “VILLAGE LIMIT” already. Eric: I just returned from weekend travel to read your comment, which is not only a fine way to start my day but also (“as for the photo . . .”) a good example of how we continue to learn from our readers.